Anyway they got us in early. 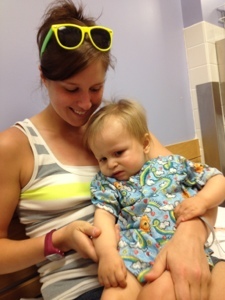 He did ok.
Because he has been so pukey they decided to intubate him for the scan to protect his airway. When he came out I was told he did vomit right in the beginning so hopefully the intubation will save us from any lung infections. 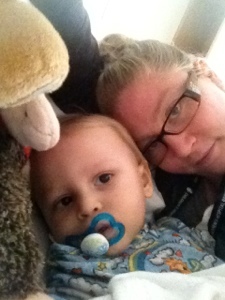 When he woke up from recovery he was greater by auntie Liz, me and Mark. It’s always hard to see him so groggy and uncomfortable coming out of anastasia so it was nice to have the three of us there. The rest of the night went well. He sleep well. Tolerated his tube feed all night without vomiting and only woke up a few times. This morning we took a walk outside to get some air. I also trying to see if he would be less irritable if we got out and moved around a bit. I don’t like that he has been on all these pain meds everyday. I feel like I can’t tell how he’s really doing. Our walk was nice, but he was not distracted and he remained pretty irritable. Once we got back to the room he got more Ativan, along with his chemo meds, to help him relax and he is now sleeping soundly again. I am wondering if he is in pain and irritated from the tumor or if it is worse now because he is also on steroids??? Either way I guess it’s better to just keep him comfortable, but I’d still like to know. 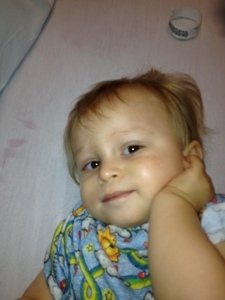 The good news is he kept his food down and as of now the preliminary look at the MRI looks good. The doctors again pointed out that this is really no garentee that the tumor is not growing, as we know it can take a long time for growth to show up on the MRI. The rest of the weekend we are working on nutrition and pain management and we will discuss tumor and oncology decisions on Monday when the team is back around. Kerri, we will miss you guys today; if Children’s would allow it, we’d bring the grill, cake, ice cream & everything else up there & party w/you!! PS – is there a limit on visitors, time, etc. – let me know & see if we can’t possibly, or at least if I can get up there tomorrow. P was super sad he wasn’t going to see Kai today.